Is Help Save Maryland Violating its Tax Status? Anti-immigration group Help Save Maryland (HSM) has a political agenda which it characterizes as “Working to make our elected officials accountable to the citizens of Maryland.” More specifically, the group seeks to make the State of Maryland inhospitable to illegal immigrants through influencing a variety of public policy decisions. HSM, like any other group, has a First Amendment right to express its political views. But it also claims a tax-exempt status with the federal Internal Revenue Service and that could be a problem. Non-profit organizations may file with the Internal Revenue Service (IRS) to obtain tax-exempt status. One such category is governed by section 501(c)(3) of the Internal Revenue Code, which allows non-profit organizations (and contributions to them) to be exempt from federal taxes if they are organized for one or more of the following purposes: religious, charitable, scientific, testing for public safety, literary, educational, fostering amateur sports competition and the prevention of cruelty to children or animals. HSM has broken this rule at least three times. In January 2008, the organization formally endorsed GOP candidates Andy Harris (CD1) and Steve Hudson (CD8) for Congress. In May 2009, HSM advocated for the defeat of Nancy Navarro in the 2009 Council District 4 special election. In an email to its supporters, HSM stated plainly, “We need your help this Saturday and Sunday May 2 & 3 in Montgomery County. HSM is fighting the election of Democratic Candidate Nancy Navarro for County Council in a District 4 special election scheduled for May 19.” The group called for volunteers to help defeat Navarro. And in June 2009, HSM openly called for the defeat of four state legislators for allegedly supporting illegal immigrants: Senator Jennie Forehand (D-17) and Delegates Ana Sol Gutierrez (D-18), Sheila Hixson (D-20) and Saqib Ali (D-39). Help Save Maryland makes endorsements for Congress. In general, if a substantial part of the activities of your organization consists of carrying on propaganda or otherwise attempting to influence legislation, your organization’s exemption from federal income tax will be denied. However, a public charity (other than a church, an integrated auxiliary of a church or of a convention or association of churches, or a member of an affiliated group of organizations that includes a church, etc.) may avoid this result. Such a charity can elect to replace the substantial part of activities test with a limit defined in terms of expenditures for influencing legislation. Private foundations cannot make this election. A general question for the reader. Check out HSM’s website. Do you see anything OTHER than propaganda there?? Any attempt to influence any legislation through communication with any member or employee of a legislative body or with any government official or employee who may participate in the formulation of legislation (direct lobbying). There are exceptions, including “making available the results of nonpartisan analysis, study, or research” and “examining and discussing broad social, economic, and similar problems.” HSM no doubt would claim that its activities fall within these areas. But take a look at content like this attack on Gold Star father Khizr Khan as a “Muslim Brotherhood agent who wants to advance sharia law” and decide for yourself if this qualifies. The IRS’s monetary limits on allowable lobbying expenditures, including “grass roots expenditures” intended to “affect the opinions of the general public or any segment thereof,” are complicated. For small non-profits with limited resources, a key rule is “the lobbying nontaxable amount for any organization for any tax year is the lesser of $1,000,000 or 20% of the exempt purpose expenditures if the exempt purpose expenditures are not over $500,000,” with different limits for larger organizations. Clearly, any organization that spends most of its resources on lobbying, including grass roots activities to affect public opinion, would have problems complying with this provision. HSM’s gathering of signatures for Robin Ficker’s term limits amendment, its email on the petition’s behalf and its defense of Donald Trump are definitely intended to “affect the opinions of the general public.” And more broadly, an individual perusing HSM’s website and blog would have difficulty spotting content that is NOT political in nature. 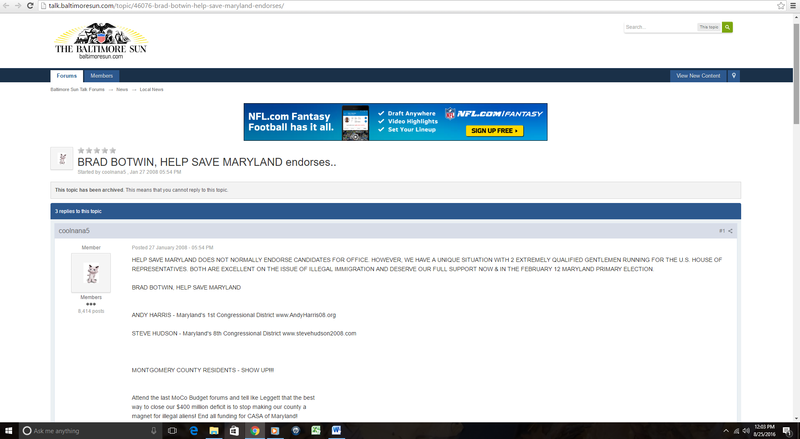 Help Save Maryland has every right to express political opinions. That’s not the issue here. But it does not have a right to engage in little other than political activity while being exempt from federal taxes and collecting tax-exempt contributions. Your author is no tax lawyer, but from the facts presented above, it seems possible that Help Save Maryland’s activities may run afoul of the IRS’s 501(c)(3) rules. Help Save Maryland, a non-profit organization opposed to illegal immigration, sent out the following email on Friday, September 9 calling for its supporters to counter-protest an anti-Trump rally in the District. Note the email’s overtly political message. We will have more to say about this in an upcoming blog post. Members of the Hispanic illegal immigrant community, bused in and fed by their pimp handlers from CASA of Maryland, National Council of La Raza (The Race), and other taxpayer subsidized “citizen hate groups”, are holding a rally in front of the new Trump Hotel in DC on Monday, September 12, from 12 noon – 4PM. You can count on members of the DC City Council, always opposed to private sector investment and job creation, to be their as well. Despite the fact the Trump Corporation has refurbished and remodeled the entire Old Post Building on 12th Street and Pennsylvania Avenue, NW, turning an eyesore into a new luxury hotel in record time and under budget, these groups are going to rally against the opening of this new landmark Trump Hotel. I guess CASA and others were opposed to the many construction workers, Black, Hispanic and others who actually worked day and night on the project for over 1 year, rather than collect welfare, food stamps, free healthcare, housing and more like their illegal immigrant clientele. Same opposition I suppose for the hundreds of minority workers who will run and maintain this new hotel. The Anti-Trump Rally Facebook page says 600 people are signed up as attending. The Counter Protest, also from 12 noon- 4pm, will be to show our opposition to the illegal alien’s support for open borders, uncontrolled illegal immigration, and mass refugee resettlement. We fully support legal immigration and private sector job creation. If you can make it, we will be on the opposite side of Pennsylvania Ave., near the Fogo de Chao Restaurant. Location is corner of 12th and Pennsylvania Ave, NW. Short walk from the Metro Center Station – Red, Blue, Orange lines at Metro Center. Bring signs, Gadsden flags (the illegals love them), US flags, banners, etc. There will be some extra signs on site. Brad Botwin, Director of the anti-immigration group Help Save Maryland, has sent out the following email promoting term limits. UPDATE ON THE MONTGOMERY COUNTY TERM LIMIT PETITION – CITIZENS WORKING TOGETHER CAN SUCCEED! Recent e-mail I received on the status of the Term Limit Petition which will revitalize the MoCo County Council and County Executive if passed this November 2016 by the voters. The professional politicians are getting nervous! Thank you for signing the non-partisan term limits petition for Montgomery County. We did it! You and nearly 18,000 registered voters in Montgomery County signed the term limits petition (only 10,000 signatures were required). The signatures were submitted on August 8, which means you’ll be able to vote on the term limits question on the November 2018 general election ballot. When passed — and we need your vote to pass the measure — it will limit County Council members and the County Executive to serving no more than three consecutive terms, or 12 years. One week from today, on Wednesday, August 24, you will have an opportunity to support term limits at a Montgomery County Charter Commission hearing. If you can’t attend, but still want to convey your support for the term limits petition; email the commission at the same e-mail address in the previous sentence. If you don’t want to speak out publicly on the 24th, please come to the hearing and stand with your neighbors in support of term limits for the County Council and County Executive. If you want to know how you can help or need more information, let us know. The gmail account above belongs to Sharon Cohen, a member of the Montgomery County Republican Party’s Central Committee. This reinforces the central role played by both Help Save Maryland and the Republicans in pushing Robin Ficker’s terms limits charter amendment. So far, no committee on Montgomery County term limits has registered with the state. Hopefully, any group advocating on the issue will obey the law, file reports and show their funding. Voters may find that information useful as they consider whether to support term limits. It was the spring of 2008. Five-term County Council Member Marilyn Praisner, who had represented District 4 since 1990, had passed away and eight candidates were running for her seat. One of them was a woman. One of them was a person of color born in another country. Her name was Nancy Navarro. At that time, District 4 included most of US-29 north of Downtown Silver Spring to the Howard County border and the areas south of Olney, east of Rockville and north of Wheaton. It had little in the way of restaurants or shopping. There was the aging, emptying business district in Burtonsville. There was the decrepit, asphalt-covered shopping center in Glenmont. Here and there, small and mid-size retail strips clung to the sides of New Hampshire Avenue and other major roads. A tiny colony of fast food and lowbrow restaurants had just sprung up on US-29 at Tech Road. Walkable urban shopping was nowhere to be found. If residents wanted that, they would have to drive to Downtown Silver Spring to get it. None of this was an accident. For years and years, the civic leaders and activists who dominated the district’s politics had worked hard to keep development out. Mrs. Praisner was their champion. They regarded development as a bad thing, attracting both traffic and “undesirables.” But newer residents, including people of color, wanted the restaurants, jobs and shopping that most other people around the county had. Colesville resident Nancy Navarro was one of them, and soon she became their champion. Navarro stood out during the 2008 special election, and not just because of her gender and heritage. The other seven candidates running for Mrs. Praisner’s seat, including her husband Don, adhered to her vision of little or no growth. (Don Praisner’s campaign slogan was literally “Fulfilling the Vision.”) Navarro instead talked about the benefits of economic development, such as creating jobs for residents and giving them amenities that they had not previously had. Navarro was also supported by many in the business and real estate communities and the public employee unions. None of this sat well with the old guard, who regarded developers as evil and unions as tax-happy. Navarro quickly became a target. The March debate at the Aspen Hill library typified the direction of the campaign: nearly every other candidate concentrated their fire on Navarro. Their attacks centered on the allegation that she was allegedly a “tool” of developers and unions. (It didn’t help that MCPS Superintendent Jerry Weast invited union leaders to his house to get them to endorse Navarro.) But there was more to it than that. To Navarro’s supporters, the implication of this “tool” argument was that women and people of color were supposedly not intelligent or strong enough to make up their own minds, and that when they made common cause with others, they would inevitably fall under their “control.” Furthermore, while Don Praisner’s supporters criticized Navarro for taking contributions from developers and businesses, Mrs. Praisner had done the exact same thing for years. Later, it was revealed that Don Praisner himself accepted money from a property owner in the district seeking redevelopment. Much of this is par for the course in the rocky world of political campaigns. After all, opposition to change frequently arises in politics and outrage can be selective. But with Navarro on the ballot, it mutated into something far darker: a toxic stew of racism and xenophobia. Don Praisner defeated Navarro in the 2008 Democratic primary and would serve on the council for less than a year before he passed away. When Navarro returned to run again in the 2009 special election, the forces of extremism were prepared. First came the illegal anonymous robocalls, a repeat of a tactic used against Navarro in 2008. Then came rumors circulated both on-line and off linking Navarro (who was born in Venezuela) to the Hugo Chavez regime. Help Save Maryland, labeled by the Southern Poverty Law Center as a “nativist extremist group,” began targeting Navarro for her alleged support of “illegal aliens.” Their challenge to Navarro was posted on a racist website equating President Obama to Satan. Most bizarre of all was an email sent to Navarro’s campaign asking about her immigration status. The author wrote, “I am informally involved with a group of Independents and we are trying to identify a candidate that we feel comfortable endorsing. It would be great if you could put the rumors to rest and provide information as to when (what year) and where, which state, Ms. Navarro received her naturalization or citizenship. Thank you.” In fact, the author – who used a fake name – was a GOP activist who wrote for the party and had testified against drivers licenses for illegal immigrants. Robin Ficker was involved too. The 2008 GOP nominee, Mark Fennel, was a Ficker protégé, had spread the Hugo Chavez rumors and threatened to unleash “the Dogs of War” on Navarro. In 2009, Ficker “moved” to District 4 to run for the seat and promptly began sending out illegal flyers. During a televised campaign debate, Ficker waved a set of decade-old tax liens against Navarro and her husband in his opponent’s face. Ficker did not use Help Save Maryland’s race-baiting tactics directly, but he did not repudiate them either. Will any of this make a difference in the current debate over term limits? Probably not. Few voters have heard of Help Save Maryland and understand what the group believes. Even Ficker is less infamous now that his NBA heckling days are mostly over. In any event, voters are more likely to see term limits through the prism of their own perceived self-interest rather than how they impact specific elected officials. But make no mistake: the treatment of Nancy Navarro during the 2009 special election is a shameful blot on the county’s political history. It must not be forgotten. It must not be repeated. And hopefully, her successors will be treated with the honor and respect that all upstanding candidates deserve. We have cut unnecessary extras. Seats provide no benefit to the taxpayer, so they have been eliminated from the redesigned trains. Indeed, we have now also done away with walls and the ceiling to go with a sleek, modern flatbed design. I appreciate the governor’s support and leadership on the project. Eliminating not just doors but walls will make it easier to board and to exit the train, thus reducing time spent at stations and increasing speed, resulting in an estimated increase in ridership of 31.7%. This new design is in touch with the simplified lifestyle preferred by Millennials. Let’s face it: seats are emblematic of the bourgeois Lexus lifestyle. I’m glad that Maryland and Montgomery County have said “yes” to our smart growth future by embracing open plan light-rail. Heck, I never thought the Governor would invest so much money in areas that will never vote for him. Now, I’ll have to come up with all the money that Montgomery County promised when I’m Council President next year. I don’t see why I shouldn’t just run for Congress instead. Update: Why is Hate, I mean Help, Save Maryland a Tax-Deductible Charity? Your contributions to Help Save Maryland are tax deductable. This group busies itself perpetuating hate of blacks and gays, but its main joy in life is to spew vitriol about undocumented immigrants and CASA de Maryland. Many organizations have two counterparts–a (c)(3) that conducts in educational and other tax deductible non-political activities and a (c)(4) that engages in politics. Donations to the latter are not tax deductible, and the two types of organizations have to be kept carefully separate. Help Save Maryland thus describes its focus on “awareness and education” in an effort to fit the (c)(3) mold but lets the mask slip when it states that it “provides an effective voice for citizens frustrated by our out-of-touch Maryland politicians.” Its tag line on the top right of its web page says “Working to Make Our Elected Officials Accountable to The Citizens of Maryland.” That sure sounds like non-tax deductible lobbying to me. Haters are gonna hate, as Rep. Aaron Schock recently reminded us at the beginning of the unfolding scandals that led to his resignation announcement yesterday. But that doesn’t mean we have to give them a tax deduction to lobby for it. In 2015, bigotry can sometimes get defined down. But sometimes, the genuine unquestionable article stares you in the face. Help Save Maryland, an organization dedicated to fighting “the negative effects of illegal aliens,” provides examples. Montgomery County Executive Ike Leggett has always been a slippery operator. Had the County Taxpayers pick up his legal tab some years ago when he was accused of sexually harassing a Blonde Haired White Female Staffer while he held an earlier county elected position. Apropos of nothing, they dredge up an old charge from 1992 in order to perpetuate the oldest racist trope in the book of black men as sexual predators. And just to make sure you got the message, it was clearly important that they mention that she was “Blonde,” “White,” and “Female.” Would it have been okay by HSM if the accuser had been a brown-skinned illegal alien male? And, while I’ll plead guilty to many a typo due to lack of time and a proofreader, who capitalizes “blond” or “female” when they are not at the beginning of a sentence? HSM did not want you miss these key points. So, the dream won’t be realized, but you’re going to continue pursuing it. Do I have that right? What dream is Ms. Lynch after? Blacks and other minorities have equality in America. They can work. They can own a home. They can marry. They have all the same rights that whites have, so what is the dream Ms. Lynch is pursuing? It’s the same dream the sodomite community is pursuing: special rights. Why aren’t black people more grateful? I mean, we allow them to work, even to own their own homes. Gosh, they can even get married. So demanding, these people. It’s almost impressive that someone can manage to sound so churlish about African Americans having access to very basic rights and feels it necessary to place Dr. Martin Luther King Jr.’s “dream” in pejorative quotes. Only HSM thinks that Loretta Lynch’s desire to follow through on it makes her some sort of radical. “Sodomite community” has a nice ring but it lacks the certain quaintness of “open homosexual,” a term used in the article they cite as evidence that LGBT people want “special” rights. They’re almost as demanding as those uppity black and brown people.